Masjid Sultan Ahmad Shah, the State Mosque of Pahang, Malaysia is inspired by Ottoman–Moorish style architecture, the largest dome is in the center of four rocket-shaped minarets and four smaller domes. The mosque can easily accommodate 8,000 people at any given time and is conveniently located in the heart of Kuantan’s central business district. Meticulous geometric patterns line up the walls’ interior and exterior facade. The color theme is light blue with white marble patterns and yellow glass windows. When the minarets are lighted, it gives an effect that the mosque is somehow lifted. 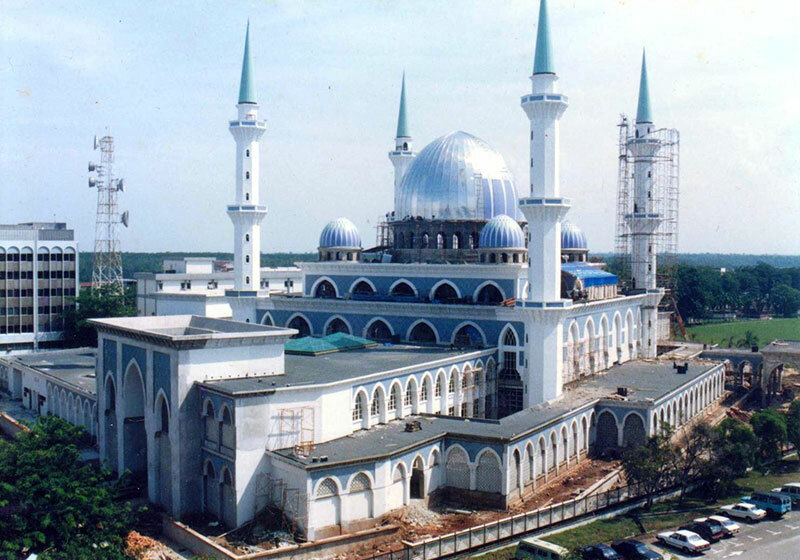 Opened in 1994, Masjid Sultan Ahmad Shah I was named after the first ruler of Pahang: Sultan Ahmad Al-Mu’adzam Shah. Short Description: The Sultan Ahmad Shah State Mosque is Pahang's state mosque. It is located in Kuantan, Pahang, Malaysia. Masjid Sultan Ahmad Shah, the State Mosque of Pahang, Malaysia is inspired by Ottoman-Moorish style architecture, the largest dome is in the center of four rocket-shaped minarets and four smaller domes.